Featuring gold-clad relay contacts that will not oxidize or tarnish, this relay board provides a convenient way to switch low-level signals in your data acquisition project (e.g., multiplexing sensors being read with a single ADC input). It is also suitable for use in automated failure-injection testing (e.g., short-open testing for sensor harness FMEA verification). This board includes two SPDT relays, logic-level relay driver circuits, and protection diodes. 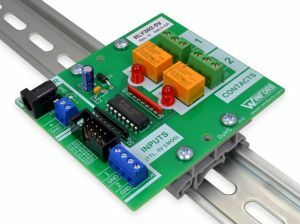 Simply provide the board with power, connect your logic-level signals to the inputs, and the relay contacts are ready to use. The relay contacts are electrically isolated from the rest of the board, which allows the board to be used in a wide variety of low-current applications, including both AC and DC loads. 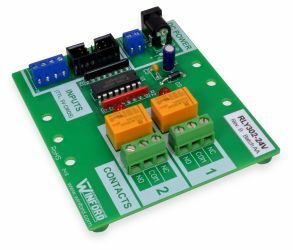 With this relay board, a logic-level signal (e.g., 3.3V or 5V) or higher-voltage signal (up to 25V) can be used to control a relay. Examples of logic-level signals include the outputs of an I/O card or a microcontroller's output pins (e.g., Arduino or Raspberry Pi). Please note that the relay coil voltage you select has no effect whatsoever on the voltages you can switch with the relay contacts. Also note that the relay coil voltage you select does NOT affect what voltage is needed for the input control signals. For any of the coil voltage options (5, 12, or 24V), an input control signal from 2.5VDC up through 25VDC will activate the relay. See datasheet for input current requirements. Approximate dimensions: 3.4" x 3.0"